When I visited her last week, Fran Conley was full of stories. She lovingly recounted a tale of her mother hauling jugs of water to have drinking water on weekend escapes to their rustic cabin. She fondly reminisced about driving her father out to the family’s property in his final years, and watching his disposition become lighter the instant he set eyes on the magnificent redwoods. Over the course of five decades, the Krauskopf-Conley family thoughtfully stewarded their 191-acre property in Shingle Mill. Now, thanks to the generosity of Fran, the property belongs to the public and will remain a nature sanctuary in perpetuity. On June 23, 2017, POST facilitated the transfer of ownership of the property to Midpeninsula Regional Open Space District (MROSD). This was the latest in POST’s inspiring relationship with the Krauskopf-Conley family. In 2004, the Conleys donated of a conservation easement over the property. Despite the property already being protected in perpetuity, Fran approached POST in late 2016, expressing a desire to go a step further and dedicate the land to the public benefit, for current and future generations to enjoy. POST worked with MROSD to transition the property into public ownership. Two things set this project apart in my mind. First, Fran insisted that the donation benefit POST, MROSD, as well as the Sonoma Land Trust (SLT). As a full-time resident of The Sea Ranch on the Sonoma coast, it was important to her that her local land trust benefit as well. At the end of the transaction, POST and SLT ended up with a cash donation, while MROSD acquired the land at a bargain sale price. Because of the local nature of land trust work, rarely, if ever, do we get to work so closely with, and learn from, other great land organizations like Sonoma Land Trust. This project provided a unique partnership opportunity and built relationships between our two organizations that will still be bearing fruit for years to come. The other thing that set this project apart was Fran herself. Rare is the opportunity to work with a landowner whose sole motivation is one of conservation-minded generosity. Fran wanted to her gift to recognize her parent’s legacy while acknowledging the societal importance of maintaining open space. I was inspired each and every day of this project to help Fran to carry out her vision. 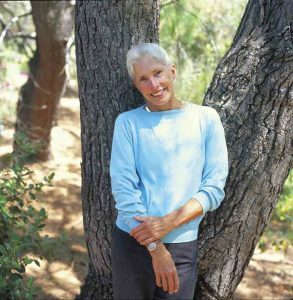 When Fran donated the conservation easement in 2004, she remarked that her parents felt the “land should remain the way it is, without big homes, fences and paved roads.” I invite you to join me in collectively thanking Fran for making sure that will never happen. 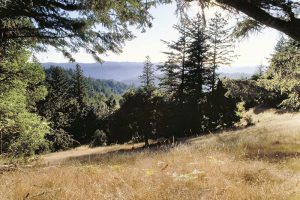 There are not currently any plans to open the property to public access, but MROSD will manage the land until such time as it becomes appropriate and feasible to do so. Justin Garland has worked for POST since 2015. As the Redwoods Program Manager, he oversees all aspects of our redwood-related work, from acquisition of new properties to stewardship of lands that have already been protected. He graduated from the Nicholas School of the Environment at Duke University with a Master of Environmental Management.